The Red Sox had a busy offseason but perhaps their biggest move has been talked about the least. Hanley Ramirez just entered his thirties and is a career .300 hitter who has played the majority of his career in pitcher friendly ballparks. He is a right handed hitter with power, coming to play ball in Fenway Park, yet nobody is talking about him. The focus instead has been on Pablo Sandoval, the blooming stardom of Mookie Betts, the new ace who is trying to prove he is an ace in Rick Porcello. What about Hanley? 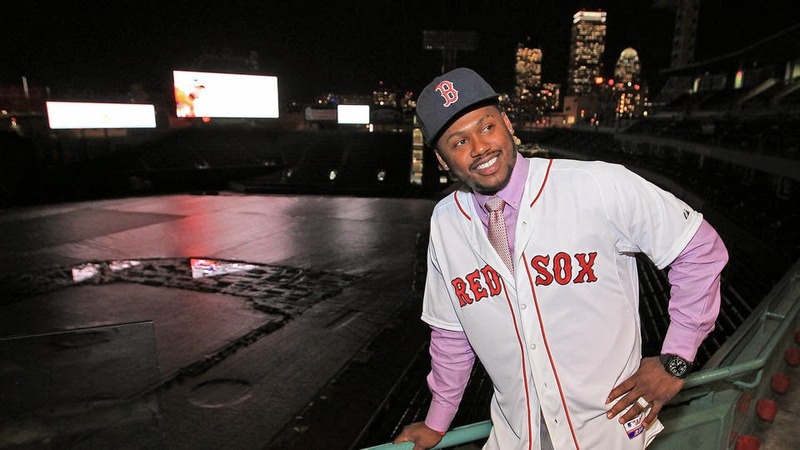 Hanley Ramirez's career numbers are .300/.373/.500 and these numbers have been done with 56.9% of plate appearances in Los Angeles, San Francisco, Miami. San Diego, Shea Stadium and Citi Field. 0.19% of his plate appearances have been Fenway Park , Baltimore, Toronto and Yankee Stadium. Get excited Red Sox fans. Beer in the Red Sox Clubhouse? What if Alex Rodriguez Signed The Mets? What if Alex Rodriguez was Traded to the Red Sox? Did the Red Sox Unofficially Hire Alex Cora Last Night? The Last Days of Jackie Bradley in Boston? A Homer and a Suicide: The Life of a Gay Red Sox Outfielder? Could Papelbon Return to the Red Sox? Will Pablo Sandoval Be a Big Fat Flop in Boston? Red Sox Notebook Red Sox History 1948 Red Sox Season Replay MLB History Notebook Minor League Baseball Notebook Minor League Baseball Red Sox News MLB History Making Fun of Derek Jeter Out of the Park Baseball What if Alex Rodriguez was Traded to the Red Sox? South Atlantic League Notebook Columbia Fireflies Notebook Interviews MLB Notebook Boston Red Sox Pregame Projections Gamecock Baseball Notes Red Sox By The Numbers Red Sox Opinion Box Score Stories The Saga of Will Middlebrooks Atlanta Braves Baseball Betting System Boston Red Sox Daily Fantasy Baseball Projections MLB Draft MLB News Red Sox History Notebook 2019 Calloway's Bracket Challenge Alex Rodriguez Baseball Betting Brice Turang Chip Caray Dale Murphy Dave Dombrowski Jay Groome New York Yankees Red Sox Daily Seth Beer What if Alex Rodriguez Signed The Mets?